Gorgeous!! I just how perfectly the plaid paper and ribbon go with this image. Have a great weekend. Love your card -- so clean and crisp looking. Just like biting into one of those juicy apples, fresh off the tree! Ooooo...love the country look and the bucket of apples, Janice! Black, red, and white is one of my favorite color combinations! Have a fabulous weekend, my friend! Great use of the sketch, Janice! This will be great for your farm stand stash! I can hardly wait for Saturdays to get here so I can see the sketch and what you've done with it! This is super cute! What a pretty card Janice. Love that image, the colors... the paper is perfect... and I also love the scallop border! Have a fabulous weekend! Love this! 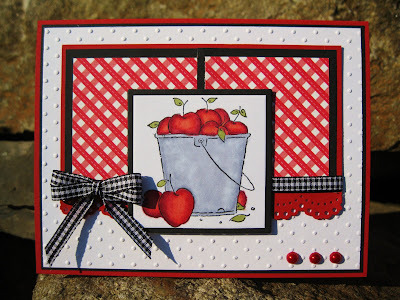 The sketch is terrific, I love the apples and the gingham makes it country-sweet! Red, Black and White is always my FAVORITE!!! Great card!